The inhabitants form 3 linguistic groups. The German-speaking inhabitants of South Tirol (approx. 65%) live mainly in the land areas and side valleys. The Italian population (approx. 30%) lives mainly in the towns. The Ladins (approx. 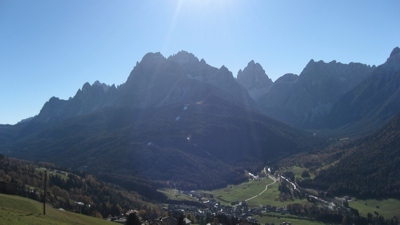 5%) live in the Dolomites valleys: Gader-and Grödner valley. The large part of the South Tyrolean population belongs to the Catholic church. The South Tyrolean population is valid as open, cooperatively and hospitably. Special traits are huge stubbornness and pragmatic flexibility. Both still does not seem to contradict. The country South Tirol is the most northern part of Italy and lies at the south side of the Alps. The Italian-Austrian border runs here about the Alpine main ridge whose best known crossing is the Brennerpass. It is one of the most important north south connections in the Alps. 60% of the country lie on a height of more than 1,500 metres above sea level. The special situation allows a distinctive winter as well as summer tourism. In the valley situations, above all around Meran, Bolzano and the Unterland, the whole year rules mild climate. The known South Tyrolean wines and apples this area are popular specialities for insiders. The main valleys are the Etsch Valley, Eisack Valley, Vinschgau and the Puster Valley. Many museums and castles testify a moved and concerning the contents varied history. The nature reservation parks and nature reserve houses express the narrow physical attachment of the inhabitants of South Tirol: Nature reserve Stilfserjoch, nature reserve Schlern, nature reserve Texelgruppe, nature reserve Puez-Geisler, nature reserve of Fanes-Sennes Prags, nature reserve Trudner horn, nature reserve Sextner Dolomites, nature reserve Rieserferner-Ahrn, and nature reserve Sarntaler Alps. These physical sheep and civilised country sheep stand under special protection. A preservation of nature and scenery, education and immediate physical experience are the concerns of these facilities. In the country South Tirol the nature-searching also finds wonderful and idyllic lakes: Kalterer lake, Montiggler lakes (Überetsch), Karer lake (harrow valley with Welschnofen), Pragser wild lake (Pragser Dolomites), Toblacher lake. South Tirol was always a moved country. Above all the separation of Tyrol on the 10th of September, 1919 created big risks. South Tirol was separated in the peace treaty Saint Germain of the Austrian state and was given to Italy. this time the country and his inhabitants had to live through a heavy time. The Italianisation of the country – on initiative of Ettore Tolomei had begun. Particularly after the assumption of power Mussolinis, with ban and abolition of the German, the German management and the Tyrolian Traditions the everyday life was inconceivably difficult. Besides, the Italianisation should be promoted by the Italian immigration. The darkest chapter of the South Tyrolean history became by an inhuman resettlement project with name "option". The German-speaking population had to decide either on Italy, or to leave for it, the beloved homeland and into emigrate to German empire. Hitler and Mussolini were the wire-pullers of this enterprise. Nevertheless, the second world war thwarted of this person-despising underpinned and most inhabitants of South Tirol could remain in the beloved homeland. In the Paris contract in 1946 the German-speaking population and the Ladins of South Tirol were put as a minority under protection. The autonomy statute was brought to life. This statute contain above all the strengthening of the self-government competence of South Tirol. The realisation developed sluggishly and the population of South Tirol was very discontented. Only in December, 1969 the governments in Rome and Vienna worked out the „ratified South Tirol package“. But again only in 1992 it came to this Causa to the official quarrel settlement explanation between Italy and the protective power Austria. The autonomy competence contains for the population of South Tirol the possibility to develop arbitrarily in economic and cultural area. The difficult history has also led to the fact that to itself the traditions and the affiliation to the country South Tirol has deeply rooted in the consciousness of the people. The South Tyrolean population places special value on traditions, culture and sport (approx. 55,000 cultural events and sports events yearly). On 116 municipalities of the country distributed there are approx. 200 bands, 300 choirs, 150 theatrical groups, 140 protection associations and 40 folk dance groups. By the centuries the traditional South Tyrolean art craft has set up through in our country. The material-appropriate contact conscious of nature with wood belongs to these. Above all wooden carvings are liked like saint's statues and cradle figures. felt and with a lot of diligence there originate the paws (felt slipper - slippers) are very pleasantly for carrying. Weave is probably one of the oldest craft arts of the humans – above all in the long winter evenings this craft was exercised by the farmers as an extra income. In South Tirol there is the traditional kitchen, nevertheless, the influence of the Italian kitchen is unmistakeable. The country itself disposes of numerous raw materials which are processed to known palatal joys. about pig, bovine animal and lamb up to fowl. By the available being of many waters also belong freshwater fishes on the menu of the inhabitants of South Tirol. By the preferred situations South Tirol knows almost every kind of vegetables and many fruit kinds. So the carrots, peas, radicchio, artichokes, spinach, salad and the much popular potato. Polenta (cornmeal), chestnuts, and buckwheats complete the offer. Dumplings may be absent on no menu. 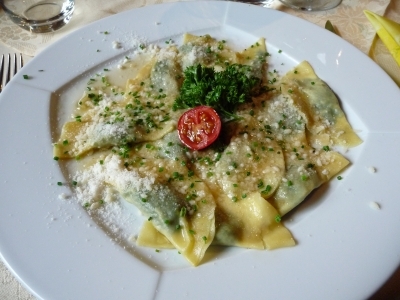 Spinach, cheese, bun, and in particular the bacon dumplings belong to the traditional Tyrolean kitchen, just as the sweet form of the dumplings (plums, apricots or yeast dumplings). Other specific features of the traditional South Tyrolean kitchen are the Tirol bacon and Kaminwurz'n with Schüttelbrot, in addition a tasty South Tyrolean cheese. On the following sides we offer to you this lusciousness. Tirtlan: Paste parcels noodle or potato dough, filled with sauerkraut and baked in fat. Goats Camembert appr. 200 gr. - Dairy Rotholz 6,55 EUR / 3,28 €/kg. Raspberry Preserve 420 gr. - Unterweger-Tiroler Schmankerl 4,30 EUR / 10,24 €/kg. Apricot Preserve 420 gr. - Unterweger - Tiroler Schmankerl 4,35 EUR / 1,04 €/100 gr. Sextner farmer salami Villgrater approx. 350 gr. 8,70 EUR / 24,86 €/kg. Malghesina / Malghese Angelo Croce approx. 0,75 kg. 22,65 EUR / 30,20 €/kg. Schüttelbrot Trenker 200 gr. 3,10 EUR / 1,55 €/100 gr. Hazelnut Liqueur with Rum Noisetto 21 % 70 cl. - Distillery Walcher South Tyrol 17,00 EUR / 24,29 €/lt. Grappa Gewürztraminer Giare 41 % 0,70 lt. - Distillery Marzadro 45,30 EUR / 64,71 €/lt. Bombardino 17% 1 lt. - Distillery Walcher South Tyrol 17,75 EUR / 17,75 €/lt. Franciacorta Brut Black 75 cl. - Quadra 23,65 EUR / 31,53 €/lt. Grappa di Moscato Apres refined 5 years 42 % 70 cl. - Distillery Marolo 37,35 EUR / 53,36 €/lt.